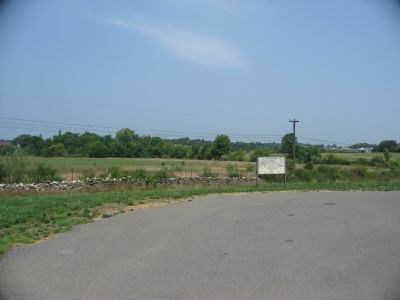 Around this site and a mile to the west occurred two major battles of the Civil War. March 23, 1862 Stonewall Jackson attacked what appeared to be a withdrawing federal force led by federal Br. Gen. Shields. 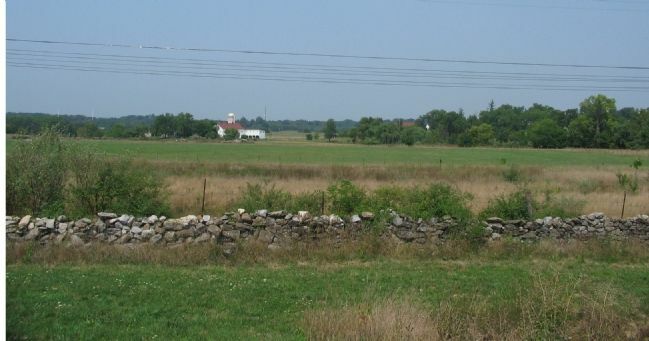 Desperate fighting along a stone wall west of here ended with the arrival of federal reinforcements and Jackson was forced to withdraw. 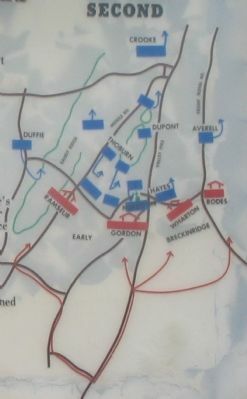 This action opened Jackson’s famous Valley Campaign and succeeded in preventing the withdrawal of Federals from the Valley to reinforce an attack underway at Richmond. Pa. This battle opened the final phases of the 1864 Valley Campaign. Erected 1991 by Winchester-Frederick Co. Historical Society. Location. 39° 8.403′ N, 78° 11.678′ W. Marker is in Winchester, Virginia, in Frederick County. 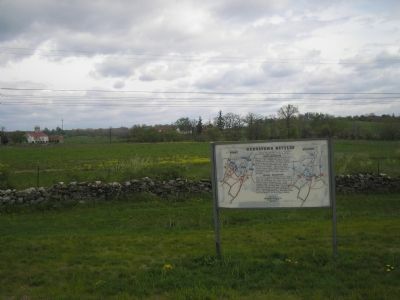 Marker is on Opequon Church Lane, on the right when traveling west. Touch for map. Located in front of the Church in the north side parking lot. Marker is at or near this postal address: 217 Opequon Church Lane, Winchester VA 22602, United States of America. Touch for directions. (approx. ¼ mile away); The Second Battle of Kernstown (approx. ¼ mile away); a different marker also named First Battle of Kernstown (approx. 0.3 miles away); The Pritchard House (approx. 0.3 miles away); a different marker also named The First Battle of Kernstown (approx. 0.3 miles away). Touch for a list and map of all markers in Winchester. More about this marker. 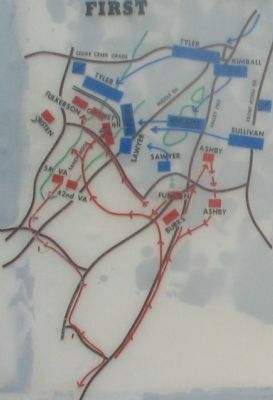 The marker displays maps of the two battles. Regarding Kernstown Battles. 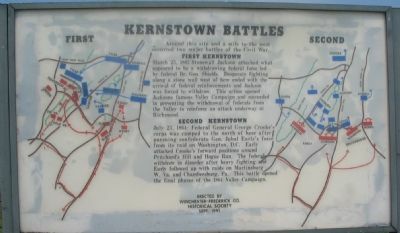 The sites related to the First and Second Battles of Kernstown are well detailed on several historical markers in the area. Aside from the Virginia State markers, there are two separate sets which explain the actions at Pritchard's Hill and Rose Hill. These are linked on the Related Markers section below. During both battles, Confederate forces advanced across the fields towards Federal positions beyond the tree line. Hogue Run passes through the treeline. The the distance are the white buildings of the Bank Farm. More. Search the internet for Kernstown Battles. Credits. This page was last revised on February 27, 2018. This page originally submitted on September 21, 2007, by Craig Swain of Leesburg, Virginia. This page has been viewed 2,635 times since then and 23 times this year. Photos: 1, 2, 3, 4, 5. submitted on September 21, 2007, by Craig Swain of Leesburg, Virginia. 6. submitted on November 16, 2007, by Bill Coughlin of North Arlington, New Jersey. • J. J. Prats was the editor who published this page.